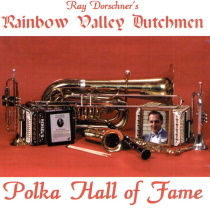 International Polka Music Hall of Fame® Ray Dorschner and his Rainbow Valley Dutchmen have played distinct, high quality polkas and waltzes in the Dutchmen style for years. The Dorschner family has composed many songs and continues to be innovative and creative in their chosen genre of music. Don't pass this CD celebrating Ray Dorschner's induction in to the International Polka Music Hall of Fame®!